There is an anti-climatic feeling in some quarters ahead of Ireland's final run out of the November internationals, but a great deal at stake for some of Joe Schmidt's fringe players. The nature of the scheduling means there is usually one game against opposition outside of the tier one category this time of year, though the additional fixture against Italy in Chicago saw the so-called weaker opposition placed either side of the main course: Argentina and New Zealand. If the Azzurri provided the starter, based on what we saw last week against the All Blacks, the dessert, the USA Eagles, should be polished off with little difficulty. "The two games that book-ended this particular series gave us an opportunity to broaden the squad," Schmidt said this week. With the hosts strong favourites to extend their home winning run at the Aviva Stadium to 12 games, Eagles head coach Gary Gold (below) is braced for a stern challenge. "We know this weekend will present our greatest challenge yet with the Ireland side still buzzing from their historic victory over the All Blacks," he said. "Ireland will be relentless as ever this weekend and our guys have spent the last week ensuring that they approach Saturday’s game with the level of intensity that will put us in the best position to meet the fight." But perhaps it won’t be all plain sailing for Ireland. With only Garry Ringrose keeping his place in the starting team, there are many unfamiliar combinations and Test experience is a little on the light side. A third of the team possess three caps or less to their name. Iain Henderson is the most experienced starter in what will be his 42nd Irish outing, with Jordi Murphy (25) next in the pecking order. You only need to cast your mind back 12 months and how a callow Ireland stumbled past Fiji. The same back row that started that day gets the nod, while similar to last year, Andrew Conway, Darren Sweetnam, Stuart McCloskey and Joey Carbery all appear in the backline. The truth is Schmidt himself probably needs to find a lot of answers about some of his personnel. What can Will Addison offer at full-back? How will John Cooney operate at Test level? Is Tadhg Beirne likely to challenge his second-row rivals for a place in a match-day squad next year? Could Niall Scannell offer further evidence that he is capable of increased game time during the Six Nations and World Cup? 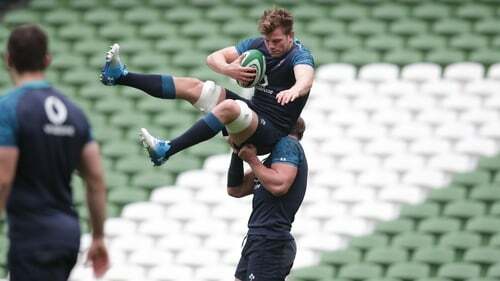 It remains to be seen, however, if the visitors have the wherewithal to truly put Ireland through their paces. The Eagles come into the contest in good form themselves, but today represents a much significant increase in standard. They have notched up wins over Romania, Samoa, Canada, Scotland and Russia since the summer in winning nine successive Tests for the first time in their history as a heavy defeat to New Zealand Maori wasn’t an official Test game. The last time the sides crossed paths was summer last year, when James Ryan and Jacob Stockdale were among five debutants in a 55-19 victory in New Jersey. Only a third of that Irish team start today, while for the Americans it is even less. Lock Nick Civetta, flanker John Quill and winger Marcel Branche are the only survivors, with former Connacht out-half AJ MacGinty absent for the Eagles. Youghal native Quill is one of three Irish players lining out for the Americans, and with 30 caps is by far the most experienced. He lines out against former Dolphin team-mates Niall Scannell and Darren Sweetnam, while prop Paul Mullen (Galway) and frontrow replacement Dylan Fawsitt (Wexford) are also involved. There’s little continuity in selection from the game last year, but with the Irish squad becoming increasingly difficult to get into, never mind the starting team, the sub-plots will make for interesting viewing. "I watched it at home with my girlfriend but after watching that you just really want to play, you want to be out there. "I just can't wait for the opportunity now on Saturday," Darren Sweetnam said this week ahead of just his third Ireland cap. "It's just important that I fit into the team," scrum-half John Cooney voiced as he looked ahead to his first start in green. Stuart McCloskey has averaged just one cap a year since making his debut at Twickenham in 2016, but he is eager to remind the coaching team of what he can offer. "Obviously I’m a bit down the pecking order at the minute," the 26-year-old admitted. "The guys ahead of me are going really well so it’s going to take a lot for me to push them out of the way, hopefully I’m there if someone gets injured." Joey Carbery gets another crack at 10, Dave Kilcoyne will look to put pressure on the Cian Healy/Jack McGrath stranglehold in the loosehead pecking order, Finlay Bealham comes in for just his ninth cap on the other side of the scrum, and Rhys Ruddock is again a more than capable understudy for Peter O’Mahony at blindside flanker. All in all, plenty of motivation for the players, even if the majority in the stand are still on a bit of a come-down from last weekend.